I have a wide monitor and I like my windows to be maximised (I’m on Windows 7). I also like when Chrome is maximised, because I usually have about 7,623 tabs open at any given time, so the bigger the window, the better. The function that’s run will toggle the width. So if it’s too wide, it will bring it down to 1050px (you can change it to your own value if you want); if it’s not wide, then it sets the width to “auto”. 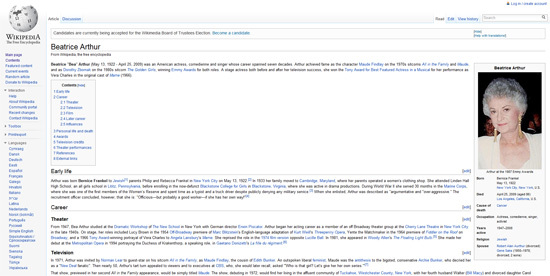 I can’t say it’s totally future proof, because if Wikipedia changes their CSS, this could make the page worse. But I think it’s pretty safe, at least for a while. Basically, it looks for a class name of “mediawiki” on the body element (which seems to exist on any article page on Wikipedia). Once that’s found, it then checks to see the status of the width of the body; if it’s not set or is set to “auto”, then it fixes it at 1050px, and adds “position:relative” to fix some absolutely positioned sidebar stuff. The “else” part of the code will bring the width and position of the body element back to normal. The “float: none;” is not really necessary on Wikipedia, but might be necessary if you alter the code for other sites (see below). UPDATE: It should also be noted that “myBody.style.cssFloat” (if I remember correctly) will not work in IE6 and IE7, so if you need that line to work in those browsers (which I doubt you do), then change it to “myBody.style.styleFloat”. But be aware that if there are unusual values in customary CSS on the affected properties, those properties will not be toggled back to their original values. “width” and “position” are actually the only values that will potentially get refreshed to their original state. Maybe at a later date, I’ll update this to include Robert Nyman’s style function, or a jQuery-based solution. But for now this will do. On a related note: if you’re interested, Siddharth from Nettuts wrote a nice article on creating bookmarklets. Let me know if you see any bugs or have any overall recommendations for the code. I had to edit it so that it’s compatible with all Wikipedia languages and not just with the English version. The only thing I can complain about is the fact that it hides the languages on the left and the  links, but I can still use them if I hit “esc” multiple times before the style loads. :P I know, it’s a pain, but it hurts much less than using the standard version. Would it be possible to make a browser plugin (Chrome &/or Firefox) out of this? I think many people would appreciate it. For example I do not really want it to be in my bookmarks bar because it’s a place where I need to have more important things, but I’d still like to have use this great script. Hey, Adam. I’m glad you found it useful. I have never created a browser plugin, and I have no idea what’s involved in something like that. But if anyone wants to take this measly little piece of code and turn it into one, they are free to do so. You always have 7,623 tabs open at any given time? I think it’s weird if not insane. 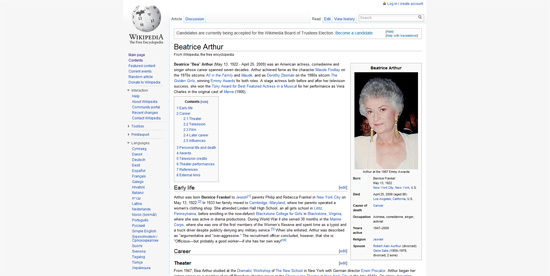 I just found it funny that of all the Wikipedia articles you could have chosen for your screen caps, you picked Bea Arthur’s page. There aren’t any problems on Wikipedia’s layout. It is a feature. You can reach zoom page for well reading on big screen resolutions. You’re right, that’s a good point. But I wonder if this can be improved to ensure that it doesn’t go full-width on really wide windows. Just wanna say thank you. It works so great in Safari and enabled me to use smart zoom again to save my sights. Yea, I wish there was a Chrome extension for this.